This means that a business account for your company or organization has already been created and it uses the same email address as you have specified on the business account registration form. You have been invited to become an administrator of that business account. How is it possible that a business account has already been created? Your company or organization uses a permanent license for older versions of Parallels Remote Application Server and has a valid Upgrade Insurance plan. In this case, the business account might have been created automatically. 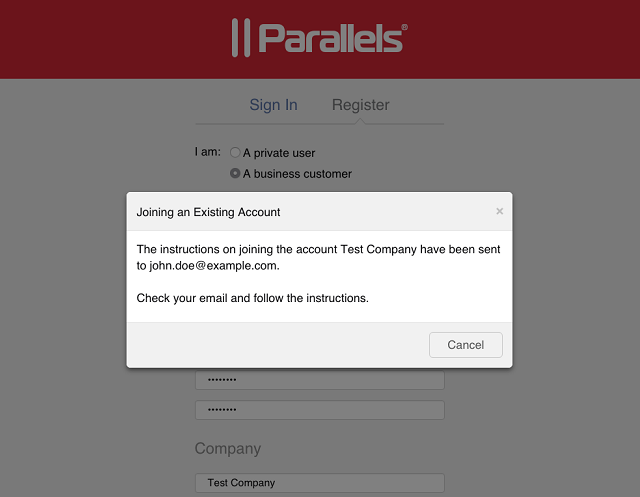 A subscription or permanent license for Parallels Remote Application Server was purchased via the Parallels Sales team or a reseller (not online). This results that a business account for your company or organization, as a brand new customer, is created automatically. 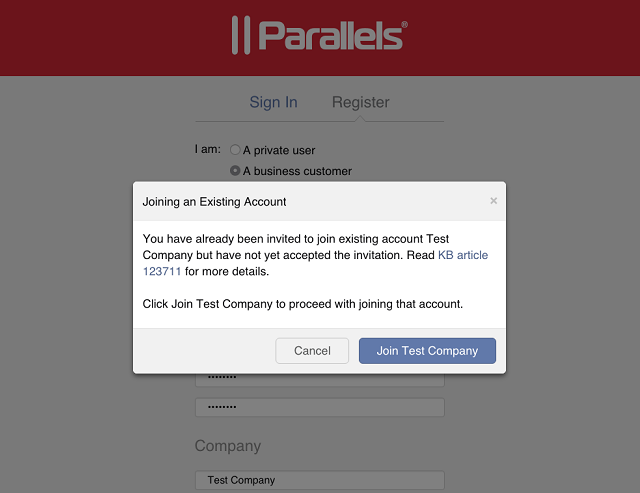 Your company or organization uses other Parallels business products (e.g., Parallels Desktop Business Edition or Parallels Access for Business), and someone else in your company or organization might have created a business account. What do I do if I encounter a pending business account notification? 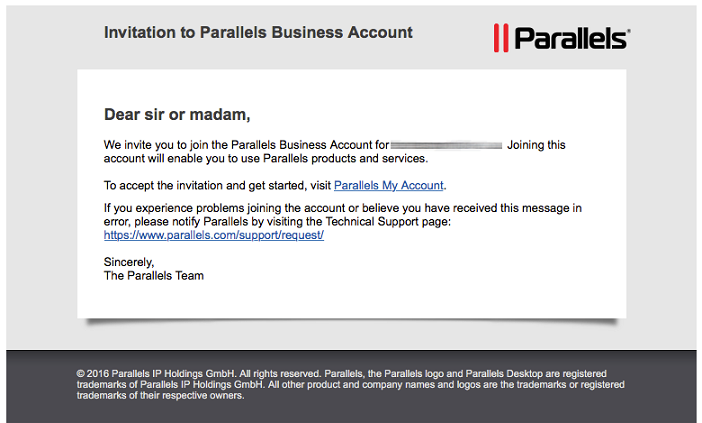 Check your incoming emails to locate an invitation message from Parallels. If you can't locate the message, make sure to check your SPAM folder. Follow the instructions in the invitation message. What if I found the message but encounter an error when trying to join an existing business account? Most possibly, the invitation that was sent some time ago has already expired. You need a new invitation. Follow the instructions in the next section. What if I can't locate an invitation message in my inbox? 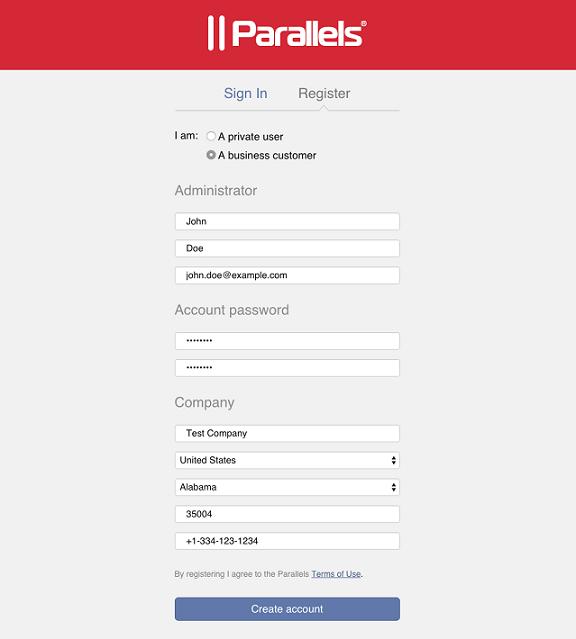 Open the Parallels My Account Registration page at https://account.parallels.com/#/register_ba. Make sure I am a business customer option is selected. Complete the registration form. Specify the email address you used when you tried to create an account in Remote Application Server. Click the Join $COMPANY_NAME button, where $COMPANY_NAME is the name of the company or organization that was assigned when the business account was created. An invitation email will be sent to the email address you have specified. The invitation email contains an action link that allows you to join an existing business account. Check your incoming emails for an invitation message. If you don't see the message, make sure to check your SPAM folder. 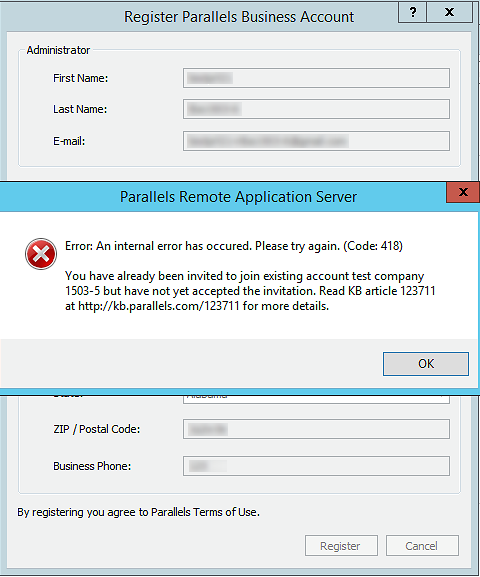 If you manage Parallels Remote Application Server, see KB 123620 for more information on using a business account when activating or upgrading Parallels Remote Application Server.